Oh how I love banners for parties! There’s something incredibly festive about a banner that sets up the right decor and ambiance for a party. The tone, the theme, the feeling of FUN lights up the room. 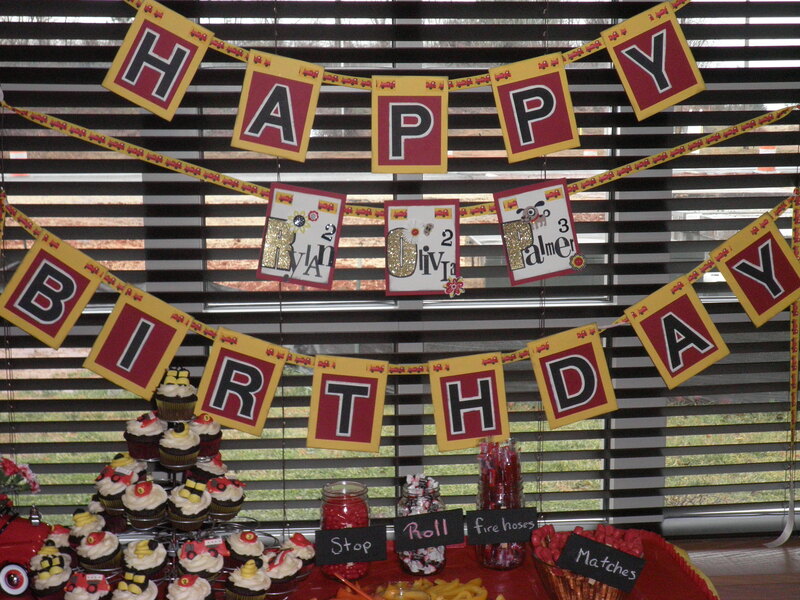 Wanted to share 2 banners I did for my niece – her 2nd birthday at a fire station and her 3rd at a bowling alley. The bowling ball and pins were cut with my Silhouette Cameo (the greatest invention – EVER). The black letters were cut as well for the “Happy Birthday”. 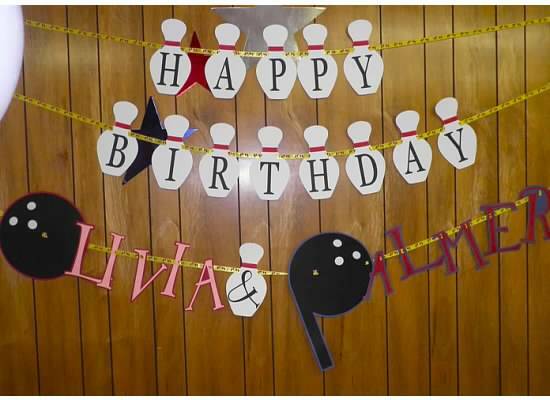 The Olivia and Palmer names were printed, then backed with cardstock and then cut by hand, as well as the bowling balls (my own creation to use those as the letters). 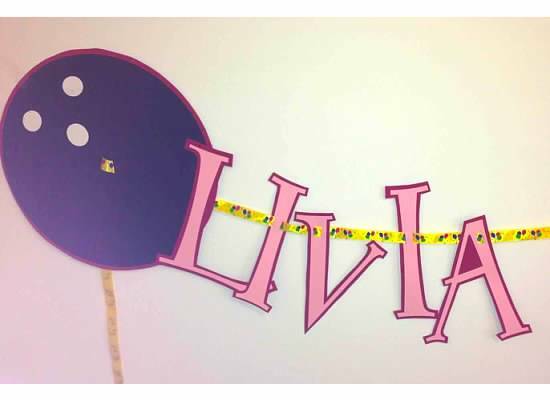 The “happy birthday banner” with non-custom names would be $20-25, which includes choice of colored ribbon (this one I found had bowling balls on it!!) To add something like these custom letters – they were HUGE.. the bowling balls were about 12″ in diameter, that would be $40.00. Here’s a closer look at the detail. Everything printed on textured Bazzill cardstock. Basically, I would work with you on whatever theme you want, send samples, discuss size, detail, etc. A basic banner would be $20, but I could design anything custom, just for your special occasion! Here’s a more basic banner I did for a firehouse themed party. There are some amazing banners you can find on Etsy.com. I don’t want to steal anyone’s work, but basically I could do any theme, any design you see on there – just for you, one-of-a-kind with love from ScrappyMags (and I’m confident I’ll meet or beat the price!)! You can also do a search for “die-cut machines” on Amazon or Ebay and find some great deals! 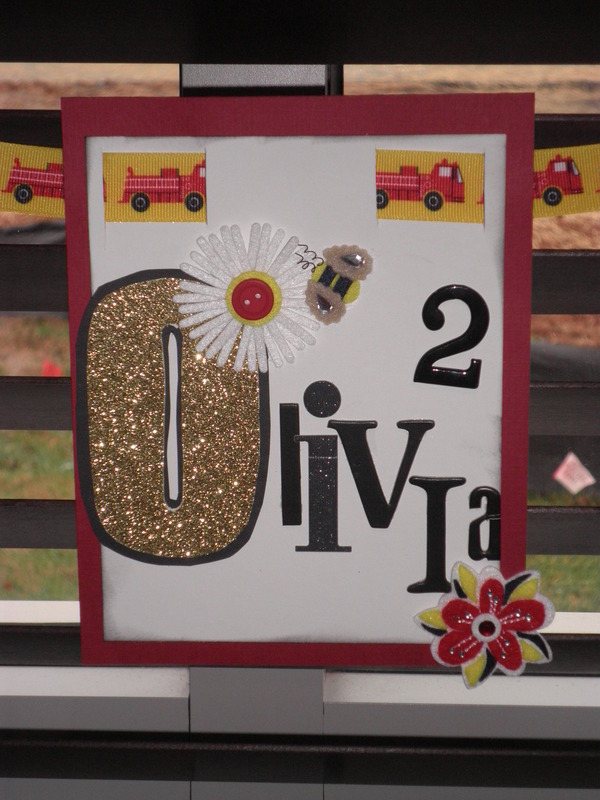 This entry was posted in Uncategorized and tagged 2nd birthday, birthday, birthday banner, bowling banner, bowling party, custom, fire station, fire truck, toddler. ← Uh, oh. I Am Officially Spray Paint Slutty.